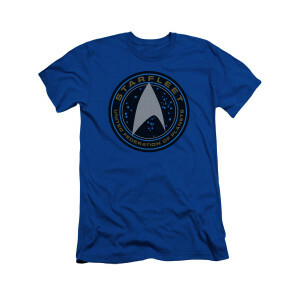 Explore the furthest reaches of space in the new film Star Trek Beyond and show you are a fan of the new adventures of the USS Enterprise and her crew with the Star Trek Beyond Starfleet T-Shirt. This soft royal blue shirt features the Starfleet emblem from the exciting new film. I love this shirt! It's pretty decent quality, the color and logo are not faded or blurred. I'm female, 5'4", 147lbs, and I purchased a size small. The shirt fit perfectly...and by that I mean that it's not terribly tight, but if I gain a few pounds then it just might be.